Architecture. User Experience. Exploring the overlap of physical and virtual. Autumn is by far the most spectacular season in Korea, in my opinion. Since the 70% of Korea is mountainous, the transformation of color is quite dramatic. 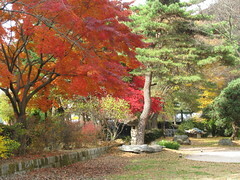 These photos were taken in Namhan-San-Seong Park, located about half-an-hour from Bundang where I live. Growing up in Korea, going to visit Namhan-San-Seong always seemed to entail a long road trip to me, but I was shocked to see how close it had become. Seoul has expanded quite rapidly to the South since I last visited, and I now I find Namhan-San-Seong is actually between where I live, Bundang and Seoul itself. My little ones are oblivious to these memories of Seoul’s past and present of course. As much as they seem permanent, cities do change. Both in our memory and physically. More photos of Namhan-San-Seong in my Flickr set. Follow comments to this entry by RSS 2.0 feed. Post a comment, or trackback from your own site. The view was very breathtaking during autumn in Korea. Thumbs-up for the beautiful pictures! 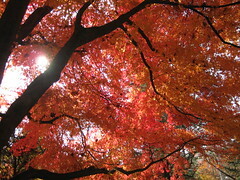 I am planning to go to Seoul this year, preferebly during autumn. However, I am still not sure of the weather there. When should I go in order to experience the autumn season? Is it ok if I go in early October (from 2nd Oct to 11th Oct)? I hope the temperature won’t be too cold at that time.